Phil Thompson captures your home in exacting detail in his bespoke house portraits. More than just a place to lay your head, your home houses the memories closest to your heart. The place where you brought up your children and hosted countless family dinners, your home's walls tell the story of your life. Artist Phil Thompson captures this most special place in exacting detail in his bespoke portraits of your home. In a timeless black-and-white palette, his crisp architectural illustration displays the beloved elements that distinguish your house, from your favorite stained glass window to an endearingly crooked fence post. Select a favorite picture of your home, or send in a snapshot of the family's old barn, your first home, your great-grandmother's brownstone, or any structure that speaks to your memory. Handmade in Chicago, Illinois. Click hereto learn more about Phil's Studio and process! Inspired by a love of architecture and history, artist Phil Thompson creates illustrations of homes and buildings. He works out of a 1912 Craftsman style studio on Chicago’s storied Ravenswood corridor. 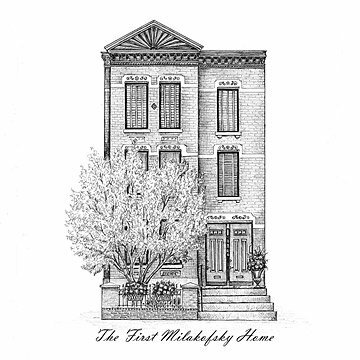 The homes of his city inspired him to start capturing their “personalities” in pen and ink for their proud owners. Arrives matted in 11"H x 14"W mat. Drawing is on 8"H x 10"W paper.Send clear photos of the home you would like illustrated. Include a photo of the home in full view and photos of the details that you would like the artist to highlight. Please limit to 3 photos.